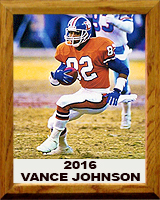 Vance Johnson ran track and played football at Cholla High School in Tucson. He was actively recruited by the University of Arizona where he continued the two sports of his passion. Johnson competed in the 1982 Olympic trials in the long jump. His college career bests as a track star were 10.45 in the 100 meters and 26’ 11 1/2” in the long jump. He won the NCAA long jump in 1982 but failed to make the cut for the Olympics. With full focus on football Johnson played all purpose back (runner-receiver-returner) but often started at tailback and let the Wildcats in rushing as a freshman. Johnson owned several business during the ensuing years and currently works for Behavioral Health of the Palm Beaches as a Marketer, Certified Recovery Coach (CRC) member of the Pro Recovery Team made up of former professional football and basketball players, Behavioral Health Technician (BHT), Counseling and Spiritual guidance and as part of a Group Psychotherapy and Psychodrama Team led by Dr. Meg Givnish. Johnson is also engaged in the public speaking arena. Speaking out about the deadly effects of addiction and the freedom of sobriety to anyone who will listen—especially to our youth.